The Emerald tablet of Hermes is an essential and core document in the teachings of the Law of Attraction. The tablet is a short inscription on a green stone and it details the law of attraction and the law of manifestation. The Emerald was originally thought to have been discovered by “Balinas”. He wrote down the entire text in the syriac language. This stone is so important that many have provided their own translations including the famous Sir Issac Newton. The Emerald Tablet if Hermes and the Law of Attraction is supported by a number of other independent sources including quantum physics. The Emerald Tablet is also the basis of spiritual alchemy. 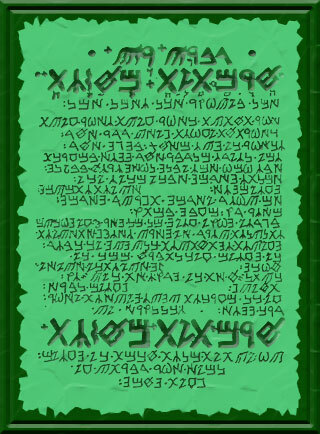 Here is a version of the Emerald Tablet of Hermes taken from 12th century Manuscript. And complete is what I had to say about the work of the Sun. This statement affirms the entire Universe in all spheres of reality is not separate in any way whatsoever, but is rather a continuum from the very highest aspect of “The One”, “The Source”, the “First Cause”, down to the physical world of matter. This phrase also affirms the continuum of the Universe is equally effective and integral in all directions, above and below, below and above, all working in complete harmony as an inseparable aspect of the whole. In this statement, “wind” is analogous to the Universal Mind as opposed to the physical element of Air, which is the mediator of the Universal elements of Fire and Water. Wind or Air as a mediation of Fire and Water therefore represents the forces involved behind the process of creation, ultimately resulting in the final Universal element of Earth in the creation process; Earth representing solidification. Earth nourishes the creation thereby providing for independent form and existence as can be clearly witnessed by the presence of the physical world of matter. This process is continued by you. We are co-creators with the One or First Cause because we spring forth from the One. In this we can create our own reality, and this is largely accomplished by the Law of Attraction. It is important to note, that everything external or Macrocosmic is also Microcosmic. This statement refers largly to the process known as the law of Vibration. However, it expresses the concept of the Law of Attraction, as the above is attracted to the below and the below to the above. Sincve the universe is primarily an expression of mind, it is vital that we monitor our thoughts as this is the microcosmic represenative of the above, and therefore that which we create in the heavens will descend to the earth and become our reality. Literally every millionaire claims that first their money was made in their mind, and then it became reality in their physical existence. It is the same with health and everything else. The phrase all obscurity will flee from you is about being specific. It reminds you as co-creator to be specific with your thoughts and your goals. The law of Attraction works best when you are specific. This confirms that through the act of creation as previously described, the Consciousness of The One is “whole”, complete and of infinite strength, and with the ability to work without restriction in all directions of the continuum of the Universe from above to the below and below to the above at any level of density and vibration, and in particular the power to surpass any “upwards” travelling entity. This statement also confirms your potientlal to do the same. You have the power thorught the Law of Attraction or what others call the Magic of Light to create the Universe you want. Therefore when you read the healdlines in the Newspaper, do not get angry, rather ask why you have created this world, and begin creating a world that is more in keeping with you values. There is nothing you can overcome, for all subtle things, thoughts and the spirit of thoughts can penatrate all solid things. This confirms by this process of force descending into form thus realising self-awareness, followed by another cycle of creation, followed by a further descent into form, this eventually results in the physical “world”, or more specifically the entire physical Universe of matter in the space-time reality. The world you create through your own inner magic is first created in the world of Spirit. This is the first creation, and from it descends back and forth creating the world of matter. Thus the law of vibration and the Law of Attraction play a special role in creating the world you want. This statement is not intended to be a self-proclamation of greatness on the part of Hermes but rather represents the trinity of the levels or aspects of the continuum of the Universe; physical, Astral and Mental. This final statement affirms the testimony of Hermes as to the creation and true nature of the Universe. Hermes Trismegistus, Hermes the Thrice Crowned, was indeed a true symbolic “messenger of the Gods. The work of the sun expresses the Divine creative process that we all go through in the creation of the universe and in the creation of our own lives. This is a basic overview of the Tablet of Hermes. You can use this formula to create a world of harmony and love or a world of hate and anger. We share the choice. We are co-creators with the Divine Source, the One, the All. The Source expresses itself through us. This May Be One of the Most Important Things You Will Read. I just read this on the Golden Dawn Trust website. I have not found anything other than the Emerald Tablets of Hermes that is written so concise. Read this and you will understand how Miracle Mentoring works, and why magical trance work is so vital to begin attracting what you want in life. “Our subconscious minds have no sense of humor, play no jokes and cannot tell the difference between reality and an imagined thought or image. What we continually think about eventually will manifest in our lives. Unfortunately most of us are completely unaware of this fact and we do not monitor our thoughts with the care needed so that we can create in our lives the results we say we want. Since the great majority of people do not feel worthy and deserving of abundant good fortune, radiant good health and total success in all areas of their lives that overriding thought pattern controls the results people get. The first order of business of anyone who wants to enjoy success in all areas of his/her life is to take charge of the internal dialogue they have and only think, say and behavior in a manner consistent with the results they truly desire.” — Sidney Madwed. P.S. Consider attracting Miracles in your life with Miracle Mentoring.